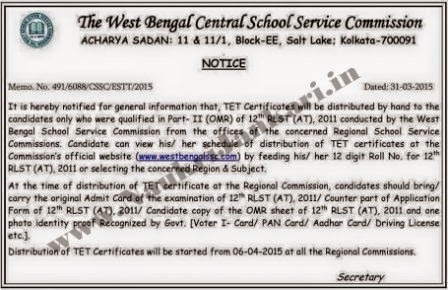 West Bengal School Service Commission (WBSSC) has notified that they will distribute TET certificates by hand to the candidates who were qualified in Part-II (OMR Paper) of 12th Regional Level Selection Test (RLST). The certificates will be distributed from from the offices of the concerned Regional School Service Commission. 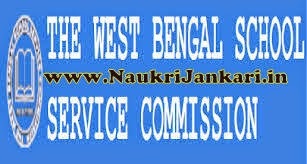 The schedule of distributing of WBSSC 2011 TET certificates has been mentioned on the official website of WB School Service Commission. Candidates have to put their Roll No. to get the schedule. The subject-wise and region-wise schedule have also been given on the website. What documents are required to get TET Certificates? One photo identity proof such as Voter Id card, PAN card, Aadhaar Card, Driving License etc. So friends, see your schedule of certificate distribution on the commission's website. If you have any query feel free to ask us as comments. 14 comments for " TET Certificates of WBSSC 2011 Exam (12th RLST) "
How the certificate will be beneficial to us? As per NCTE rule, once you qualify in TET, you need not appear in written exam for up to 3 years. You need to face only interview for this period. I had passed the schedule time for collecting the tet certificate because I don't know the time for collecting that.But now the time had passed,could I get the certificate now?If I get now then I shall be ever greatful to you. Well, its totally depend's on the commission whether they would give a chance to give it or not. We recommend you to contact the commission's regional office as soon as possible. I had passed tet exam-12Rlst.At that time I was below 40 years.Now i have crossed the age limit of 40.Am I eligible now with my tet certificate for this year's WBSSC EXAM. I want to know the last date for receiving the certificate for TET2011, since I had missed receiving my certificate. I want to know that if I am not able to collect my TET cetificate then is it handd over to me by post????? Pls Reply???? i have tet certificate..so...i...dont..have,..to..reappear..this..year..tet 2015 exam....although ..i have pplied for this...please..reply....as..u..said..tet..certificate..holder..cn=an..directly..face.....the interview....isn't..t??? As you have TET 2011 certificate, you need not to apply or write the exam again. With this certificate, you are eligible to face the interview directly. But, if you want to increase your TET marks, then you can apply again. I have qualified upper primary tet in 2011 and I have already recieved tet certificate from shool service commision .Can appear in interview now with the qualified candidates in 2015 tet exam ? please clear me . When will the date of interview of upper primary Tet be commenced? I have collected the certificate of Tet 2011. Is there any further procedure in between?the validity of years as mentioned on my certificate is upto 2018. Quite tensed about the date of interview as my age is also growing with years. Need a quick and apt reply. Thank you.